Bangalore- 25 September, 2014: It may be recalled that on Friday, September 19, 2014, some students of Government Urdu Higher Primary School, DJ Halli, Bangalore, had complained of stomach ache and vomiting. As reported in the media, about 350 students were rushed to Dr B R Ambedkar Medical College & Hospital. The students were under observation for a few hours and all of them were discharged the same evening as there were no serious medical issues. The leftover of the food from the school was sent for investigation to the State Public Health Institute (PHI). Today the PHI has released their report and has said that the count of E-Coli and Coliform pathogens are within safe limits (PHI report enclosed). The media had also reported that a dead lizard was found in one of the rice container in the school on Sept 19th. The PHI report also says that there were no traces of Salmonella bacteria, which is associated with lizard poisoning. Akshaya Patra has a protocol for testing & documenting the ingredients that are used in it’s kitchens on a periodic basis from certified NABL accredited laboratories apart from following well established in-house quality control protocols .The organisation reaffirms its commitment to provide safe nutritious food to the school going children. Akshaya Patra kitchens are ISO 22000 certified, which involves Good Hygiene Practices (GHP), Good House-keeping Practices, Good manufacturing practices, strict documentation of the various stages of production process, tracking all critical points in the process flow, periodic training of kitchen staff on safe food handling, etc. Akshaya Patra also affirms a culture of continuous improvement to make the food served daily to children is safe, nutritious and tasty. In the entire cooking process there is minimum human handling to ensure hygiene and food safety. The organisation invites government officials, school teachers, public leaders, media representatives, etc. to make a visit to the kitchen, with or without prior notice, to understand the process and precautions followed. Akshaya Patra requests the support of the government, donors and media in our humble efforts to serve school-going children with mid-day meals and support their nutrition and education. Akshaya Patra is continuously leveraging technology to cater to millions of children. 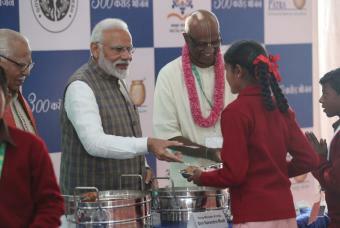 Its state-of-the-art kitchens have become a subject of study and they attracts curious visitors from around the world.In partnership with the Government of India and various State Governments, and inestimable support from many businesses, philanthropic donors and well-wishers; the organisation have grownto be the world’s largest mid-day meal programme serving wholesome food to over 1.4 million children from 10,845 schools across 10 states in India.